Are you a bug saver or a bug squasher? You are here: Home / Loving Nature / Are you a bug saver or a bug squasher? 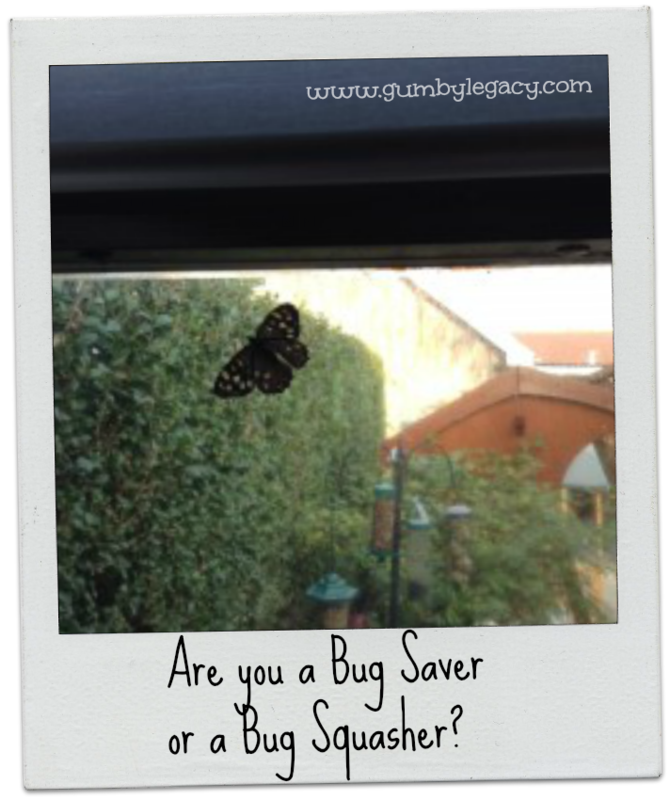 Are you a bug saver or a bug squasher? I challenge you, lovely friend of the Gumby Legacy, to learn from this post and ALWAYS rescue trapped moths, spiders and other nunu’s from now on. This post has a step-by-step guide on how to remove all small creatures without harming them or you so you have no excuses! As I was getting ready for bed last night, I thought I heard what could have been a moth fluttering by a light… Looked for it but couldn’t find it. Bit concerned it might start looking for food and start chewing my dolls clothes (my handmade, silken clad, antique reproduction dolls) but turned off the lights and went to bed. About an hour ago, I noticed said moth, on my window, caught it carefully in a plastic jug, covered the top with paper and took it outside where I sent it on it’s way to do whatever it is moths do. No more annoying fluttering for me and a happy, free moth. Here is our tried, tested (used often in our homes), method for getting rid of any creepy, crawly, fluttery, buzzing or scary looking nunus (as I always want to call them but no one knows what I mean). It also is the least harmful way as the slightest touch by human hands could leave a poor bug with serious problems. Origin from Zulu inunu ‘horrible object or animal’. That makes me happy 🙂 But I digress. 1) Get a container of some sort. Preferably a see-through plastic one like a jug or sandwich box. 2) Gently and slowly approach the creature. 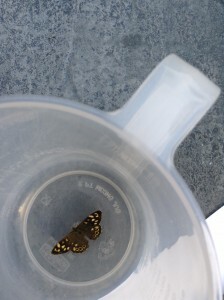 Place the container over it, trying not to trap any of its legs. 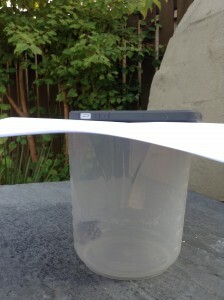 3) Slowly slide a piece of card or paper (I find junk mail booklets useful for this), under the container to make a lid. 4) Carefully lift up whole lot. Creature may have stayed on paper or run onto plastic but you can see where it is and it can’ t get you from in there! 5) Carry container outside holding the lid on. 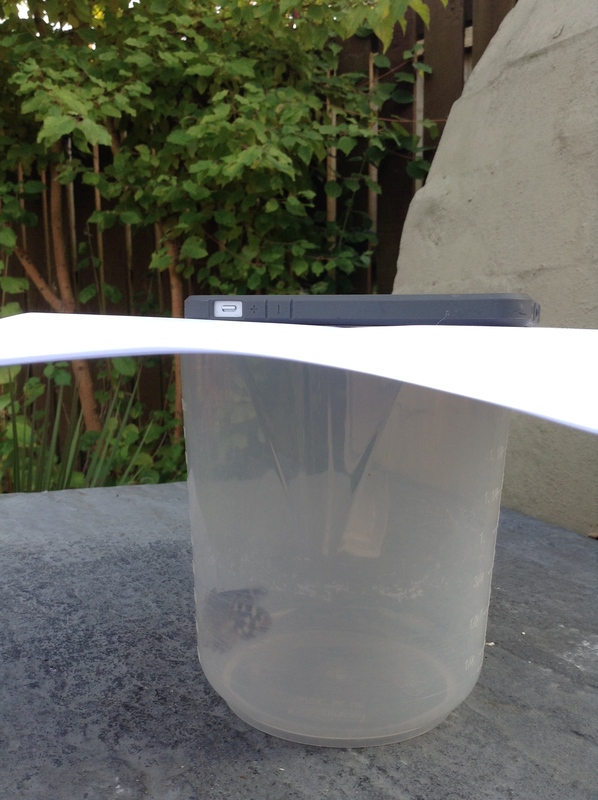 6) Remove the lid and either shake the nunu onto the grass or a plant or leave it to crawl/fly away on its own. You could also just shake it out of an open window. Or if you are really anxious, leave it exactly where it is and get somebody else to take it outside. Hopefully now you will think twice before totally freaking out and automatically killing or squashing something small next time you see it. Most tiny creatures have a really useful purpose and without them, the world would not be as we know it. No doubt we will talk about this much more in the future. What do you think? Does this seem like too much effort or will you give it a go? Are you a bug saver or a bug squasher? Keep up the excellent work !! Lovin’ it! How to make a Bug House. And why? Walk Barefoot in the Desert?